All countriesUnited StatesDistrict Of Columbia (Dc)WashingtonW Washington D.C.
Offering a roof terrace and bar, the W Washington D.C. is located next to the White House in Washington D.C. city centre. WiFi access is available. Each room here will provide you with a 37” flat-screen TV, cable channels and an iHome clock-radio. En suite bathrooms include a waterfall shower, bathrobes and free toiletries. At W Washington DC you will find a 24-hour front desk, a roof terrace and a bar. Other facilities offered at the property include the Bliss® spa, the FIT® fitness centre and a shared lounge. Guests can also dine at Pinea, a renowned European restaurant, or enjoy drinks at the hotel’s POV rooftop bar, the Living Room Bar and the Root Cellar Whisky Bar. 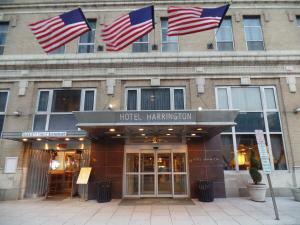 The hotel is 400 metres from White House, 800 metres from Ford’s Theatre and 900 metres from Washington Monument. Baltimore - Washington International Airport is 44 km away. When would you like to stay at W Washington D.C. ? Rooms are 74 square metres. Rooms are 107 square metres. Guests are required to show a photo identification and credit card upon check-in. Please note that all Special Requests are subject to availability and additional charges may apply. Please note, third party credit cards are not accepted at the property. Guests are required to use the same credit card to make payments at the property as used when making the reservation. Please note the property is under renovations during the following times: -Monday through Friday: 09:00 until 18:00 -Saturday and Sunday: 10:00 until 17:00 During renovations, guests may experience some noise or light disturbances. Please contact the property for details. Setup a Price watch for W Washington D.C.
Each day we'll check prices and send you an email for your selected dates at W Washington D.C.. If you don't have specific dates but would like to check prices for say next weekend or say next month we can check the price too. Click to write a review and share your experience of W Washington D.C. with other travellers.